The Doomsday Clock almost stopped in 1962. At the height of the Cold War, and with Soviet ballistic missiles close to being deployed on Cuban soil, the world teetered on the brink of nuclear annihilation during a tense 13-day stand-off between the two superpowers. Diplomatic solutions ultimately ended the stalemate, and sanity prevailed. The world breathed a collective sigh of relief as the nuclear weapons were stood down. In the intervening years, a number of armed conflicts have erupted in the Middle East and elsewhere, but the very localized nature of these bloody struggles never reached the potentially Armageddon-esque consequences of the missile crisis in 1962. Fast forward to 2017, and enter Kim Jong-Un, supreme leader of th DPRK, and Donald Trump, President of the United States. These two guys talk tough, sizing each other up, engaging in a perilous game of international stakes, juggling the fate of the world in their hands. And it so happens that the countries that these two oversized school bullies represent are highly militaristic in nature. The US’ military might is unrivalled, yet the North Koreans are not short of a gun or two, and could certainly give the US a run for their dollar. North Korea, a secretive, reclusive, and by Western standards at least, very much ‘poor’, justifies its disproportionate spending on army matters by purporting a constant threat of invasion by ‘foreign’ forces. And the country has a particular bone to pick against the United States. The seeds for the current tensions in the region were sown almost seven decades ago, when North Korea invaded its southern neighbour, firing the first shots of the Korean War. Aided by China and the Soviet Union, North Korean troops pushed ahead and brought South Korea to almost defeat. In light of the dire situation, the US came to the assistance of South Korea and helped stabilize the situation with an amphibious assault at Inchon, which effectively cut off the north’s supply lines. From then on, fighting on the ground continued on a more or less equal footing, with the struggle concentrating around Parallel 38, the ‘unofficial border’ between the two Koreas. War in the air was a totally different matter, however. The US Air Force mercilessly pounded North Korea from above, turning many of the country’s villages and towns into rubble. The country’s capital, Pyongyang, saw about 75% of its surface pulverized, for instance. The sustained bombing campaign resulted in as much as 400,000 victims. After signing an armistice in 1953, the two Koreas remained technically at war, with regular acts of aggression by the north over the course of the decades. Kim Jong-Un, the current ruler, has not forgotten the savage bombardment that his country was subjected to, and in a way, he seeks retribution. preservation of the regime, and the only real means to do so is the possession of nuclear weapons, something that both Lybia and Iraq lacked, with dire consequences for their leaders. Nuclear weapons are a powerful bargaining chip in the international game of war. If you have them, you are in the Big League, on a level playing field with the US and some of the other big boys. Kim has been steadily ramping up his country’s nuclear development program despite continuous sanctions by the UN. Past US administrations toyed with the idea of military action against North Korea, but all thought better of it. the leader’s half brother in Kuala Lumpur airport earlier this year, using the nerve agent VX. President Trump’s administration is aware that any military intervention will trigger hard retaliation. North Korean officers have recently made very public remarks to say that the US faces ‘all out war’ if it engages in ‘reckless’ military actions against their country. President Trump recently ordered an ‘armada’ to steam towards North Korean waters. The Carl Vinson (CSG-1) carrier group is now on station just off the Peninsula. North Korea regarded this move as an act of overt provocation, and responded with a tirade of bellicose rhetoric. The recent US’ Tomahawk strike in Syria was likely done as a way of showing that the US means business. US Vice President Mike Pence said that the era of ‘strategic patience‘ sported by previous administrations is now at an end. During a press conference held at a very symbolic location near Parallel 38, Mr. Pence added that “President Trump has made it clear that the patience of the United States and our allies in this region has run out and we want to see change. In other words, the US is ready and willing to engage militarily in the region. The nuclear specter, remote and largely theoretical for many years, is now back in the public domain as a palpable possibility. The nuclear giants have been sleeping in their silos for far too long. Back in the early 1960s, the US and the then USSR were playing a dangerous game of military escalation that almost triggered thermonuclear war. The USSR were using Cuba as a proxy in a high-stakes display of firepower, and when some US reconnaisance planes spotted a significant build-up of military hardware on the US’s backyard -including medium-range and intermediate-range ballistic nuclear missiles (MRBMs and IRBMs) sites-, the brown stuff really did hit the fan. The escalation directly led to the Cuban Missile Crisis of ’62, plus trade embargos, blockades, and more relevant to this piece, Cuba imposed a ban on all incoming flights from the US, a ban that has lasted to this very day. History is being written today, however, as the first commercial flight between the US and Cuba in five decades takes off from Fort Lauderdale in Florida, bound for Santa Clara in Cuba. 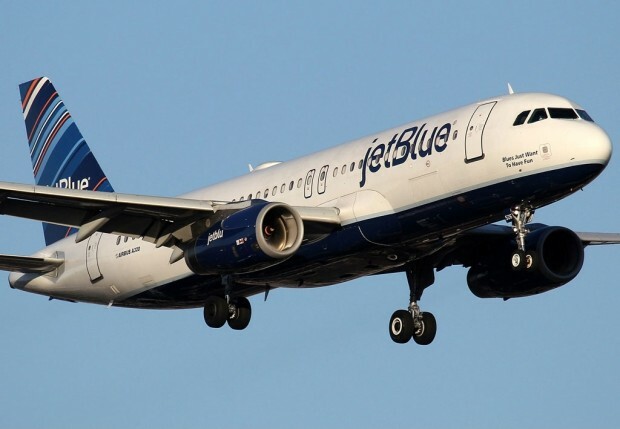 JetBlue Flight 387, a 150-seater Airbus A320, is scheduled to depart at 9:45 a.m. EDT, and will fly the short 72-minute journey into history, a journey that open up a brand new era of U.S.-Cuba travel. JetBlue’s landmark flight heralds big business, too, as other airlines are likely to establish links with Cuba in the near future. The forecast is for up to 400 flights weekly between the two countries, and with fares quoted as low as US$99 (€88) one way, most Americans have no excuse to fly to the beautiful island of Cuba.